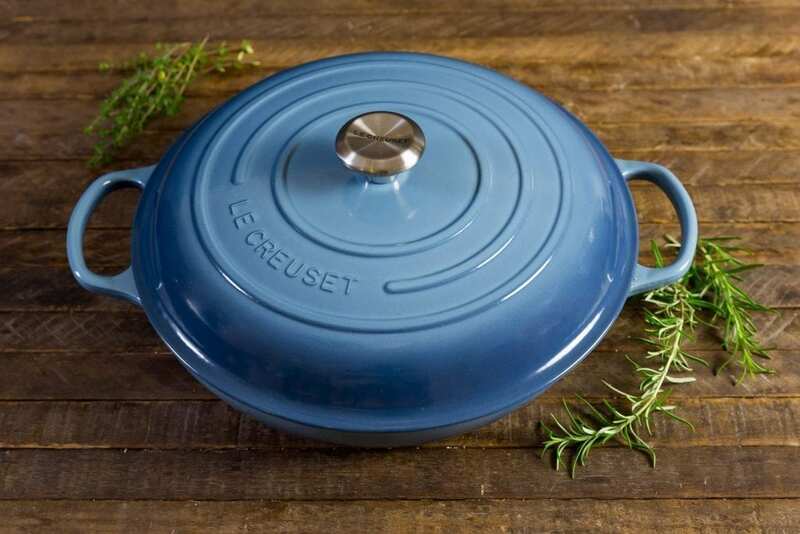 I think it was probably about 12 years ago that my mom bought us our first piece of really good cookware, a 5-quart Le Creuset dutch oven. At that point, we were still using a cheap, thin-gauge pan set I had bought in college, which burned pretty much anything that got near it, even if the oven wasn’t on. Being the weirdo that I am, I even remember the first thing I made in it, Duck Leg Ragu. I remember it, not because it was particularly amazing, but because while I was cooking it, something miraculous happened … The bottom of the pan didn’t scorch before the duck had browned. There wasn’t a blackened ring of sauce in the exact same shape as the burner. It was a red-sauce miracle! 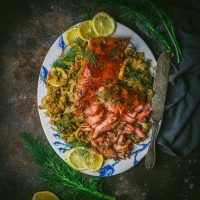 That’s when I realized that investing in a few items of really special, well-made cookware was much better than having a crappy set of pans in every size. Since then, our special collection has slowly grown, and I love each piece. We cook a lot (I know you’re shocked) and I use these skillets, fry pans, and grill pans almost daily. The great thing is, well-made cookware lasts for generations so if you have kids, tell them whoever helps in the kitchen inherits the good stuff. 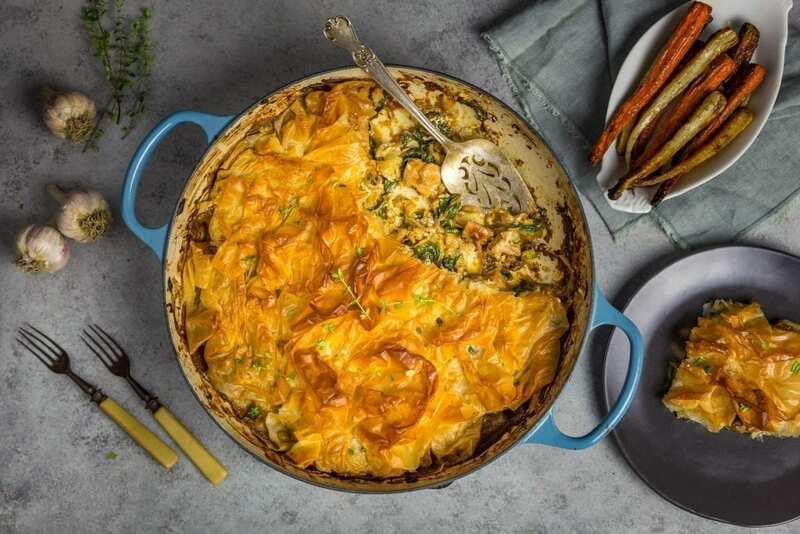 Super crispy phyllo tops a comforting, creamy chicken stew. 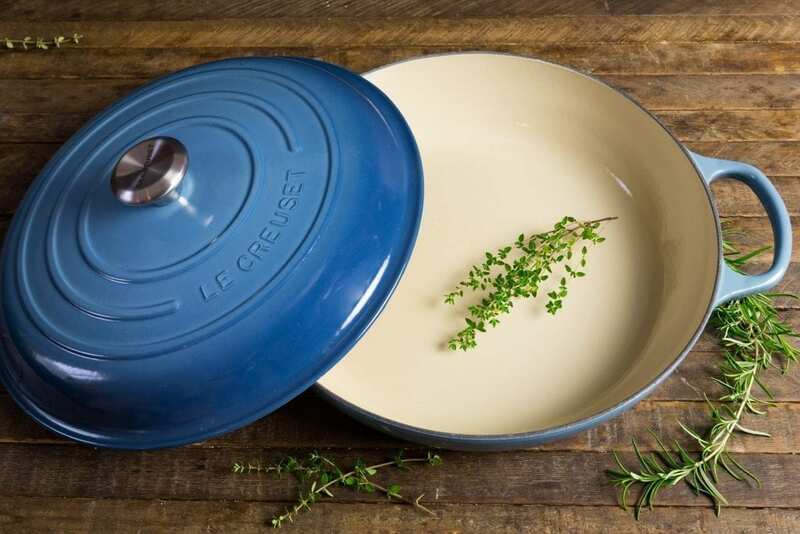 With our love of quality cookware now established, you can imagine our delight when one of our favorites, Le Creuset, sent us this gorgeous 5-quart braiser (being a food blogger is occasionally supremely awesome). It’s almost too beautiful to use, but it’s also way too functional to leave in a cupboard. Just look at this thing! It’s the most gorgeous soft sea-blue color and we’re completely in love with it. It’s the perfect size and shape for risotto (and also perfect for shallow-frying the leftovers into Arancini). It’s just the thing for braised chicken or short ribs. 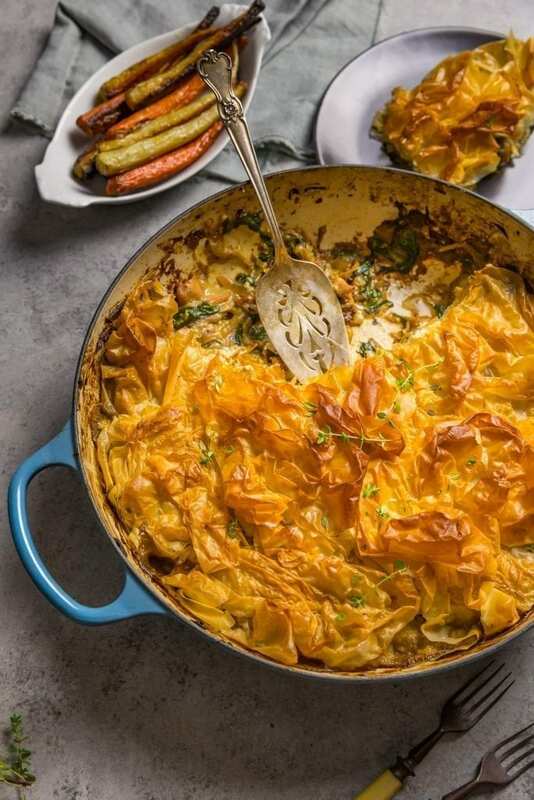 Like our Phyllo Pot Pie, most of these dishes go straight from the oven to the table so having something beautiful as well as functional is extra important. Full disclaimer: we were sent this braiser for free, but were not paid to promote it. We only promote and recommend products we use ourselves and fully recommend. Not long ago we blogged a recipe for a delicious Phyllo Torte, and it reminded me how much I love phyllo pastry. Yes, it seems a little fiddly at first – it dries out quickly so it should be kept under a moist kitchen towel while you’re working. And yes, each layer is lightly brushed with butter. 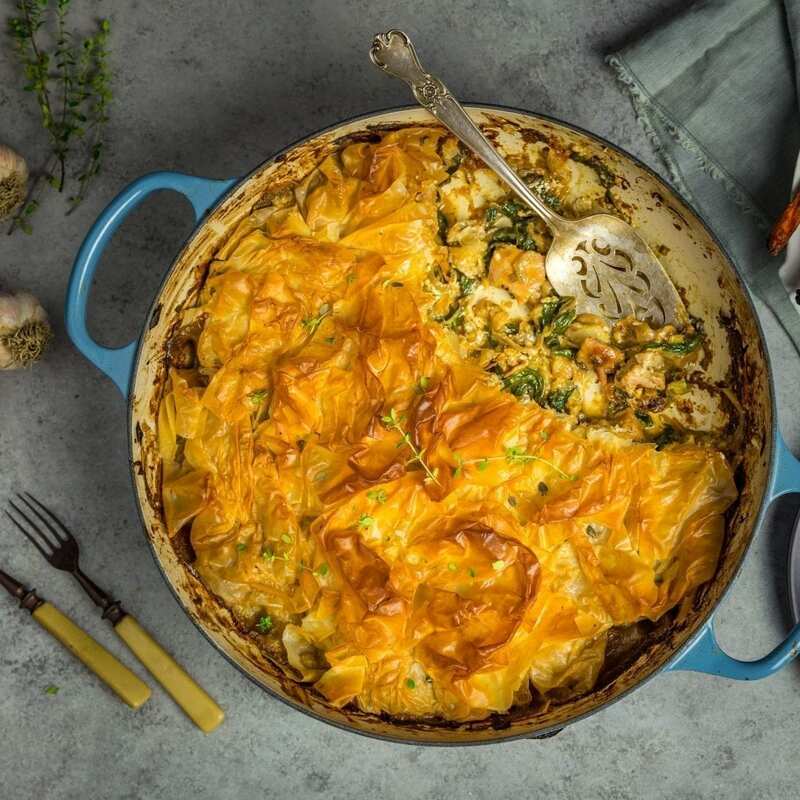 But, the truth is that it’s very forgiving, especially in a recipe like this phyllo pot pie where it doesn’t matter if a sheet rips or breaks. You’re going to scrunch it up anyway so no one will know! 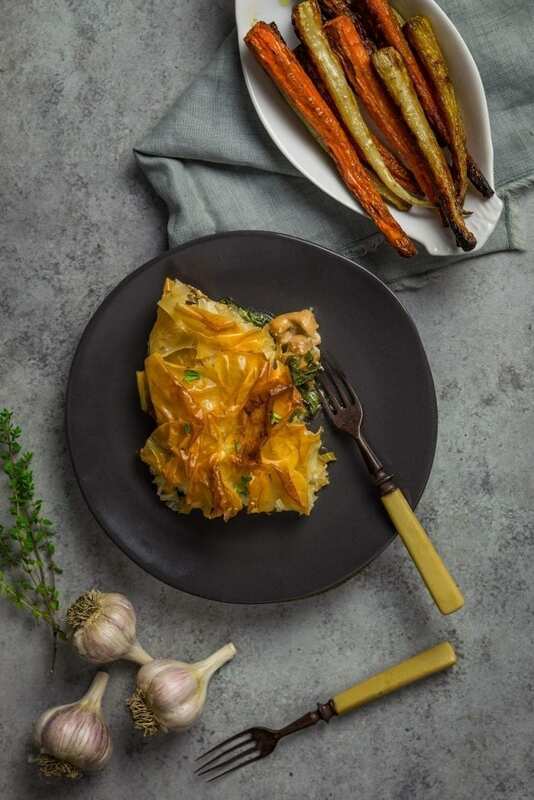 We served our Phyllo Pie with a simple side of roasted carrots . But before we get to the phyllo part of the phyllo pot pie, we need to talk about the filling. Oh man, is this tasty. We went with our favorite protein – chicken thighs – but breasts would work equally well. 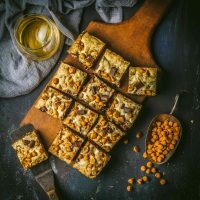 Chop them into large bite-size chunks and sauté them in a little butter until they turn light golden brown at the edges. It won’t be fully cooked at this stage which is what you want. That way the chicken won’t be over-cooked after the pie bakes. Once the chicken is browned, remove it, add a little more butter and toss in the sliced onions. It will look like a lot of onions, and it is, but they will shrink down as they cook and add a delicious sweet flavor to the pie. Seriously, if you want something to taste super-delicious, just add some caramelized onions to it. I like to season the onions lightly with salt and pepper right away. The salt actually helps the onions soften and keeps them from browning too fast. I also cover the pan for the first ten minutes or so (thank you, beautiful braiser, for the perfectly sealed lid). This speeds up the caramelizing process because it steams the onions so they soften quickly, allowing them to make more contact with the pan. While this is happening, lift the lid and stir them once or twice, to make sure they’re not burning. Once they’ve released some liquid, take the lid off and continue cooking. Any moisture in the pan will evaporate quickly and the onions will begin to color. Stir every so often, scraping up any brown bits that form on the bottom. 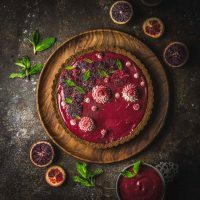 If the pan begins to get too dark and you’re worried about burning, add a small splash of water and scrape the browned bits with a wooden spoon. Do this as many times as you need, until the onions are completely soft and golden brown. Warm and comforting, but light enough for any time of the year. Now you can add the garlic, thyme, wine and the Swiss chard leaves. Like spinach, the chard will cook down a lot (though it won’t release nearly as much liquid). Add a big handful of leaves and stir until they wilt, and then add more, until it’s all in. Once the chard is wilted, sprinkle over the flour, and stir it in. It will look a little gluey at this stage but keep stirring for a minute to cook the flour before you add the liquids. Then add the stock and milk, and stir until a creamy, thick sauce forms. Taste it now for seasoning and add salt and pepper to taste. Turn off the heat, and add back the chicken and the chopped scallions and scatter over the crumbled goat cheese. 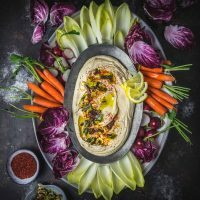 Now you’re ready for the phyllo topping. Melt the butter in a small sauce pan (on the stovetop) or ramekin (in the microwave). Set your phyllo sheets under a damp cloth and put one sheet on a work surface. Lightly brush the sheet with butter, scrunch it up, and lay the crumpled sheet on the pie. The more folds and crinkles, the better. Repeat this until the whole pie is covered with phyllo. We used about a dozen 9×14 inch sheets (phyllo also comes in 14×18 inch sheets, either size will work but you’ll use fewer of the large size). If you have any butter left over, drizzle it over the pastry. Now all that’s left to do is bake the phyllo pot pie until the pastry is golden brown and the sauce is bubbling hot. Preheat oven to 425°F. Dry chicken well and season generously with salt and pepper. Heat a 5-quart braiser or other large, heavy, oven-proof skillet over medium heat. Melt 1 tablespoon butter in the pan and add chicken in a single layer. Cook, turning once, until the edges are lightly browned, about 4 minutes. Chicken will not be fully cooked at this point. Remove from heat and set aside. Melt 2 tablespoons butter in same skillet, add onions and season lightly with salt and pepper. Cook, covered, for 10 minutes, stirring occasionally, until onions soften. Then uncover and continue cooking, stirring often, until onions turn light golden brown, about 10 to 15 minutes longer. Add a splash of water every so often if bottom of pan gets too dark. Add garlic, thyme, wine, and chard. Cook until garlic is fragrant and chard is wilted, about 3 minutes. Sprinkle in flour and cook, stirring, for 1 minute longer, then stir in chicken stock and milk. Bring to a simmer and cook until mixture is thick enough to coat the back of a spoon. Turn off heat, taste it for seasoning and add salt and pepper, to taste. Return chicken to skillet, add scallions, and mix well. Dot top with crumbled goat cheese. Melt the remaining 3 tablespoons butter in a small saucepan or the microwave. Place phyllo sheets on counter under a lightly damp kitchen towel. 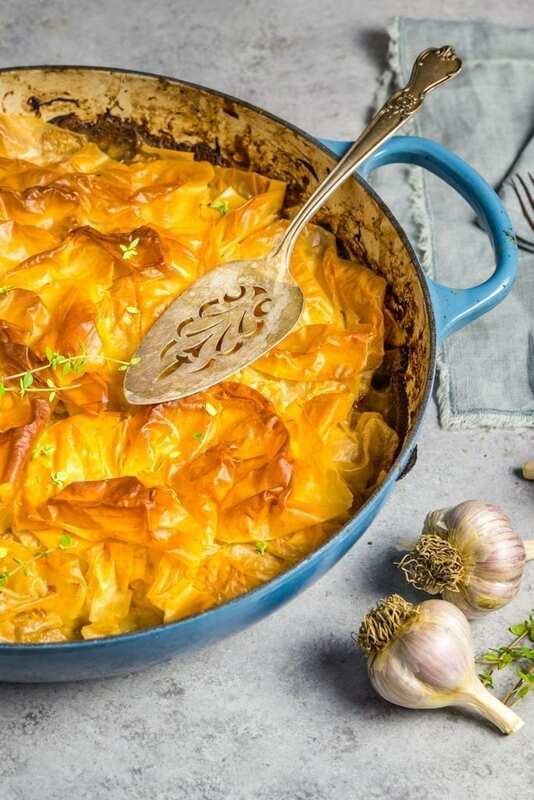 Lay one sheet of phyllo on work surface and brush with melted butter, then scrunch up the sheet and place it on top of the mixture in the skillet, the more folds the better. Repeat with remaining phyllo until the skillet is completely covered. Drizzle any remaining butter over the top of the dough. Using a sharp knife, poke several holes straight down through the dough. Bake until phyllo is golden and crisp on top, about 20 to 25 minutes. Could I swap out the Goat’s Cheese? still not a fan. Hi Bryan, yes! You can Use any creamy, melty cheese you like. Some fontina would work. A little bit of melty Brie would work. Or you could just leave the cheese out.